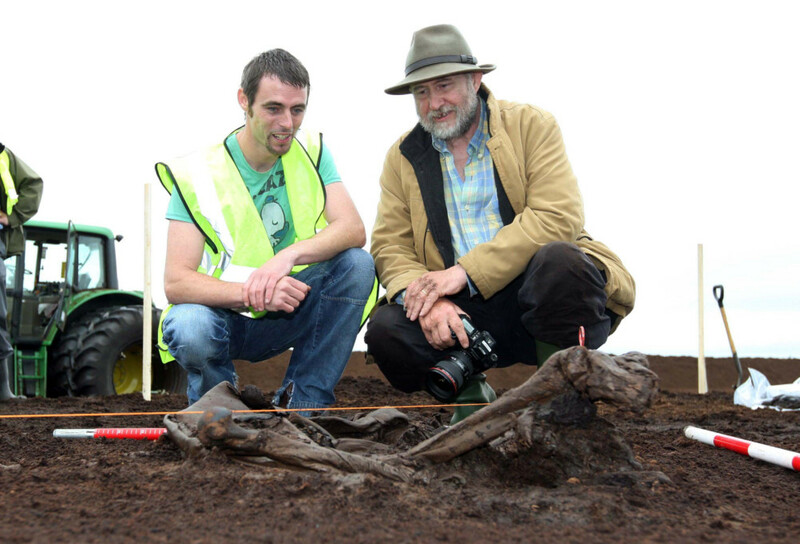 When the remains of an adult male were discovered in a bog near Cashel in County Laois, Ireland, by peat miller Jason Phelan in 2011, initial examination of the body suggested it was from the Iron Age, around 2,000 or 2,500 years old. Now the radiocarbon dating results have been published and the body is much older: it dates to 2141-1960 B.C. which makes the oldest bog body ever found and the oldest fleshed remains ever found in Europe. Archaeologists tested samples of the peat found above and below the body and one of the two hazel wood stakes found crossed above where the head would have been if it hadn’t been removed by the peat milling machine. The results confirmed the date range. It’s rare to find a burial from the Early Bronze Age with the kind of violent trauma discovered on Cashel Man’s remains. The body was placed on the surface of the bog or in a shallow pool on his right side in a crouched posture. His arm was broken around the time of death by a blow and his back, broken in two places, has cuts that were inflicted by a blade or an axe. These multiple peri-mortem mortal wounds are thought to have had a ritual purpose, sacrifice by overkill. He was deliberately covered with peat after being placed in the bag. These characteristics are seen much more frequently in Iron Age burials, which is why archaeologists initially thought the body was so much younger than it is. The original reports described the body as having been buried in a leather bag, but the more macabre truth is that the “bag” was actually his own skin, tanned to a leathery texture by peat’s natural mummification action. His knees were so tightly drawn up into such an awkward position that his legs appeared to be sticking out of a bag that kept him in such a contorted posture. The legs, directly in contact with the magical preservative that is peat’s acidic water, cold temperatures and low oxygen content, were well-preserved while the rest of him was lost. Milling machines removed the head, neck and left arm and damaged his torso. The follow-up excavation after the discovery recovered fragments of the missing parts, including the lower jaw, some teeth, ribs, collar bone, vertebra and his face which still had some short hair attached to the scalp. The two stakes found over the burial are also more commonly associated with Iron Age bog burials. They could be more evidence of a ritual sacrifice. They may have been used to tie the victim down during the sacrificial overkill procedures, for instance. The location of the body supports the ritual sacrifice contention. The bog lies on a district boundary close to Crosdubh Hill, a site used a place of assembly by the ancient Irish. Other burials on a boundary next to a ceremonially significant hill are thought to have been human sacrifices, possibly to ensure plentiful harvest, possibly as part of a sovereignty ritual like an Irish version of The King Must Die where the old ruler is rejected and killed to usher in a new era. However, now that we know the burial dates to the early Bronze Age rather than the Iron Age, comparisons to other bog burials may not be as revelatory as expected. Four thousand years ago (around 2200-2100 B.C.) inhumations were just starting to take hold in Ireland. In addition to the continuing use megalithic tombs, around this time you begin to see cemeteries of stone cists or simple pits dug into the earth, mounds, barrows, cairns. The bodies were positioned in a variety of ways — stretched out, curled up, crouched, flexed — and buried individually or in groups. In the group burials, some were buried all at the same time while others were buried individually and then the cist or pit re-opened every time a new body needed to be interred. That suggests another possible interpretation of the hazel stakes. What if Cashel Man was left in the bog for storage until it was time to inter him with his family? In that case, the crossed stakes may have been left to mark the spot for later retrieval. Cashel Man’s remains are still being studied. They are kept in conservation conditions at the National Museum of Ireland which has an extensive collection of bog bodies. Samples of his bowel contents have been tested and archaeologists are hoping the results will reveal what he ate just before he died.